When making mischief for pigs, where is the real crime? Criminal mischief is a funny concept. Mischief is fun, trivial perhaps, something kids get up to. Criminal mischief suggests we can't find a proper name for the misdemeanors that might fall into the category-hiding the Christmas lights from your neighbour's overelaborate display, for example, or toppling a rock formation. Giving water to thirsty pigs now falls into this category, as we know since the Toronto-based Canadian activist Anita Kranjc was charged with the crime in June. 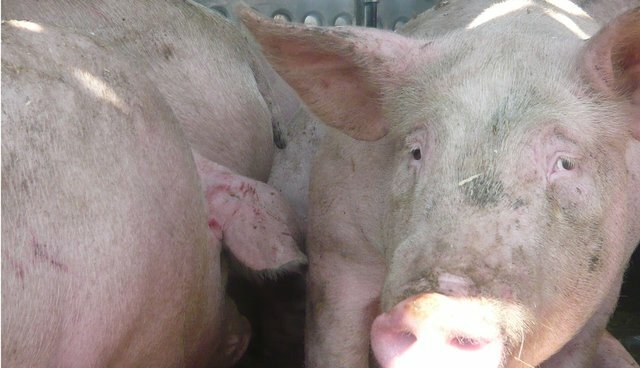 She was arrested for "interfering with the property" of Ontario hog farmer Eric Van Boekel who had sent a truck load of pigs to the slaughterhouse at Fearmans Pork, in Burlington, just outside Toronto. It was a scorching hot day in June and many of the pigs were suffering from dehydration. Back in court today for her next hearing, Anita says she will never plead guilty. Anita is founder of the Save Movement, a group that bears witness to the last moments of farmed animals on their way to slaughter. Anita told me, "Being physically present to witness the injustice faced by farmed animals throughout their lives enables each of us to more fully empathize with their plight." Bearing witness is a vital part of protest for animals, but so is mischief making. It has always been a way that protestors on any issue raise awareness to their cause in ways that are both provocative but also non-injurious: just think of those cream pies in the faces of politicians, or the red lines drawn by people's bodies to block cars witnessed last week in Paris. This ability to make mischief is central to the practice of non-violent protest: mischief challenges the status quo, but does so in a compassionate way, as with watering pigs; okay, throwing a cream pie in someone's face is perhaps not compassionate, but it certainly doesn't leave any bruises--except to the ego. Last summer I joined Anita on a vigil at Fearmans outside Toronto. I'd wanted to join the Save Movement's activities ever since I saw their work online, via the photos and video they share. A little while in, a police patrol car pulled up. She'd seen us go into the road and touch the trucks, and this could be considered an offence. "What offence?" Anita asked her. "I saw you step out into the road to touch the trucks. That can be seen as an attempt to obstruct, and that means I'm going to caution you for mischief." "I'm heading home soon," I said, worried for my passport. "I won't cause you any more trouble." Anita kept arguing for our right to be compassionate towards animals in need. Soon the officer looked exasperated, as if we were too much mischief for her to bother with. Anita offered her our leaflets. The officer looked nonplussed. It was the moment when her identity-as the enforcement of a law that says stopping a truck in its task of delivering animals to slaughter is a crime-unravelled. She put her notebook away. I walked off, hoping the confrontation might fizzle out. It did: that time, Anita got me, and herself, out of hot water. Activists who attend these vigils are vital witnesses to our culture's treatment of animals. But they are also vital mischief-makers. I'm glad I was there with Anita to make mischief on the behalf of those pigs, some of whom had already died from dehydration on the journey. There is a trace of mischief in the very word itself, which comes from around 1300, when it first defined an "evil condition, misfortune, need." It derives from the Old French meschief / méchef, to "come or bring to grief, be unfortunate"-the opposite of "achieve." At its root is the Latin caput, which means "head." Mischief, rather mischievously at least in this context, emerges from the same source as the word we use for cattle. What were we doing there that morning if we were not, quite literally, "coming to grief"? We came to a place of grief to witness this "evil condition, misfortune, need" of the animals. In being threatened with cautions for mischief, hadn't we, in that cautionary moment, achieved our mischief, a protest act of coming to grief, making visible the invisible "evil condition, misfortune, need"? At a time of disconnection between what we eat and how it is produced, and the conditions in which animals are farmed and transported, this form of mischief making is anything but criminal: it is, rather, an essential part of our rights and means to protest. When animals suffer the conditions of industrial farming, in a world where animal agriculture is a leading cause of greenhouse gas emissions, isn't now a good time to ask: What is the real crime here? Where is the genuine 'mischief' taking place? Dr. Alex Lockwood is senior lecturer in media and cultural studies at the University of Sunderland and writes on animal issues, as well as Director at the Vegan Lifestyle Assocation. His book The Pig in Thin Air on how he became an animal advocate is published by Lantern Books in March 2016.